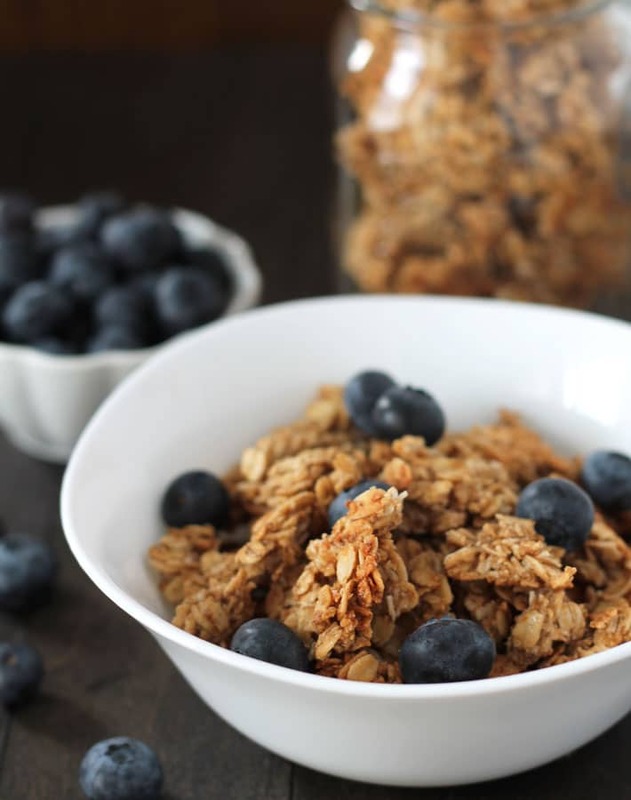 Delicious nut free granola clusters with maple and coconut are are perfect to have for breakfast, in a yogurt parfait, or for snacking on in the afternoon! This easy-to-make breakfast (or snack!) can be made on the weekend, for use throughout the week. The kind of granola I like can’t be too sweet, it needs to be crunchy, and the granola has to be clusters (I’m not a big fan of loose, crumbly granola). This is why I usually have a batch of this nut free granola in my cupboard. I think my love of granola dates back to my childhood when my mom kept a granola stash all to herself. It was a store bought box that she only got when it was on sale because it was a little pricey. When she brought a box home, we all knew it was off limits because it was her special thing. I specifically remember it being the cluster kind of granola and it was delicious. Perhaps it was extra delicious because it was off limits to everyone? Maybe. 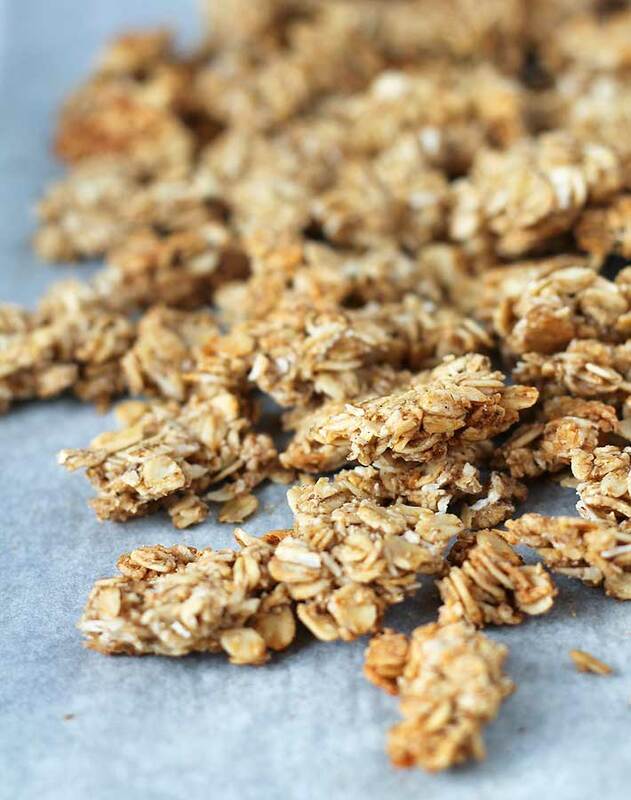 To make these homemade granola clusters, all you need is a few simple ingredients you probably already have in your cupboards. And they’re very easy to make. They’re delicious to have for breakfast, of course, but you can also enjoy them as school snacks, afternoon snacks, travel snacks…any time snacks. It also makes a nice addition to yogurt parfaits and any other recipe that calls for pre-made granola. Why Nut-Free? Can I Add Them Anyways? I chose to make my nut free maple coconut granola clusters without nuts, so my kids can bring them to school (their school is 100% nut-free this needed to be a tree nut free granola) but you can add nuts if you’d like. I have not made a nut version (yet) but I would use raw, un-roasted nuts since the granola spends some time in the oven. That oven time will toast the raw nuts up nicely. And the best part? Because they’re clusters, they’re so easy to grab and eat while you’re on-the-go. Don’t you want to grab a few of these golden, crunchy clusters right now?! 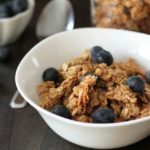 We can’t not give the maple and coconut a mention, because they contribute the majority of the flavour to this nut free granola recipe. 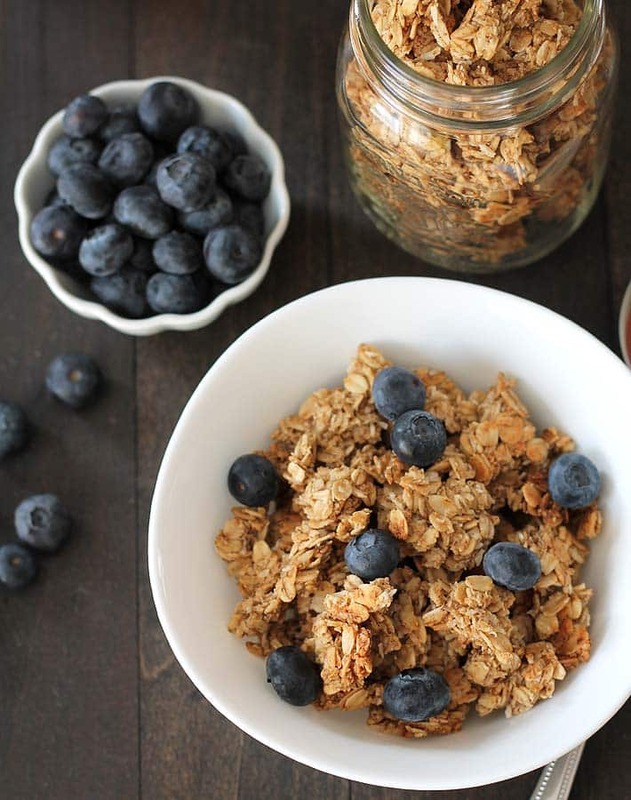 I chose to add these two ingredients because the flavour combo is so wonderful and perfect for granola. The pure maple syrup adds a nice sweetness and the shredded coconut add a rich and nutty flavour. 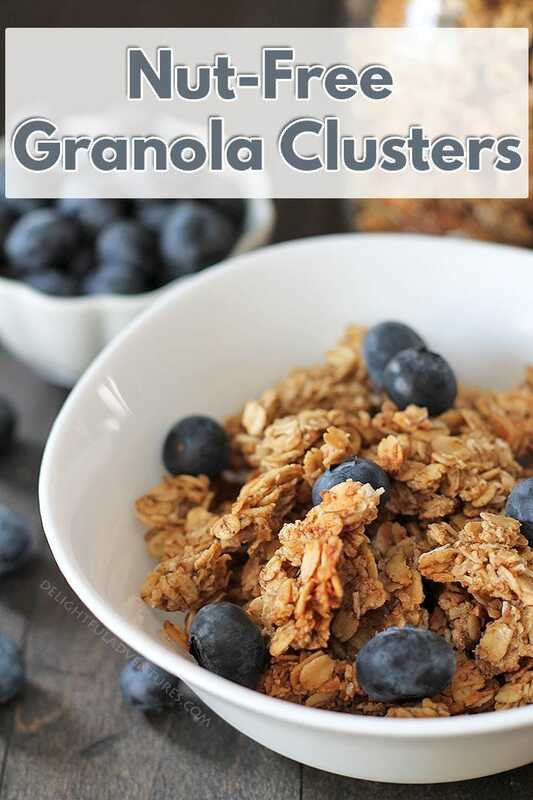 Before heading off to make your own granola clusters, click here for more delicious breakfast ideas! If you make them, tell me about it below in the comments or share a pic on Instagram and tag me so I can see. You can also pin this recipe to Pinterest! Delicious nut free granola clusters with maple and coconut are perfect to have for breakfast or for snacking on in the afternoon! Whisk together the rolled oats, oat flour, shredded coconut, coconut sugar, ground cinnamon, and salt until well blended. In a small bowl, whisk together the flax seed mixture, melted coconut oil, pure maple syrup, and the vanilla until combined. Add wet mixture to dry mixture and mix well so dry ingredients are coated. Bake for 15 minutes and after 15 minutes, rotate the cookie sheet and bake for another 15 minutes. Keep an eye on it and if you see the edges getting a little too dark, take it out. Once cooled, break into pieces. Make your clusters as big or as small as you'd like. 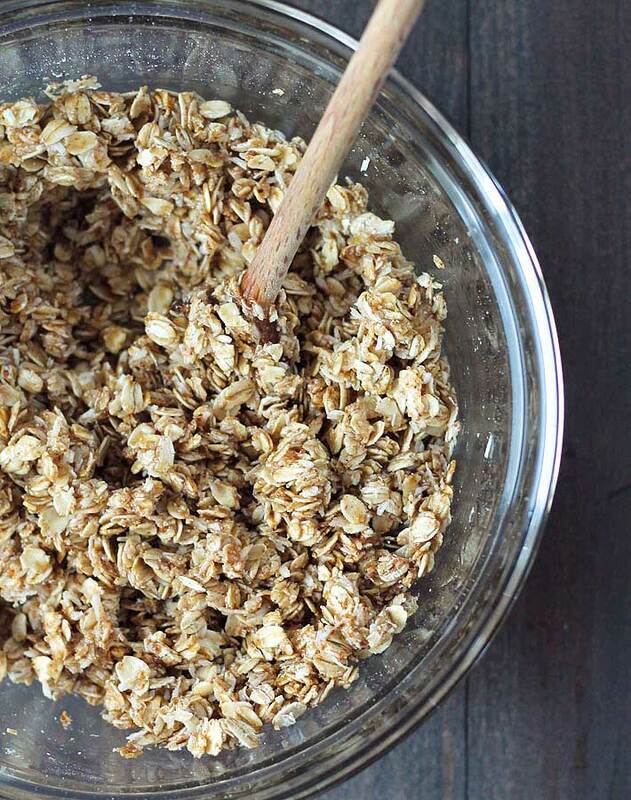 This recipe makes approximately 4 cups of granola. When flattening the mixture before baking, don't flatten too much or it will burn but flatten enough so it's not too thick. If it's too thick, the clusters turn out soft and not crunchy. You want it to be about 1/4 of an inch thick. 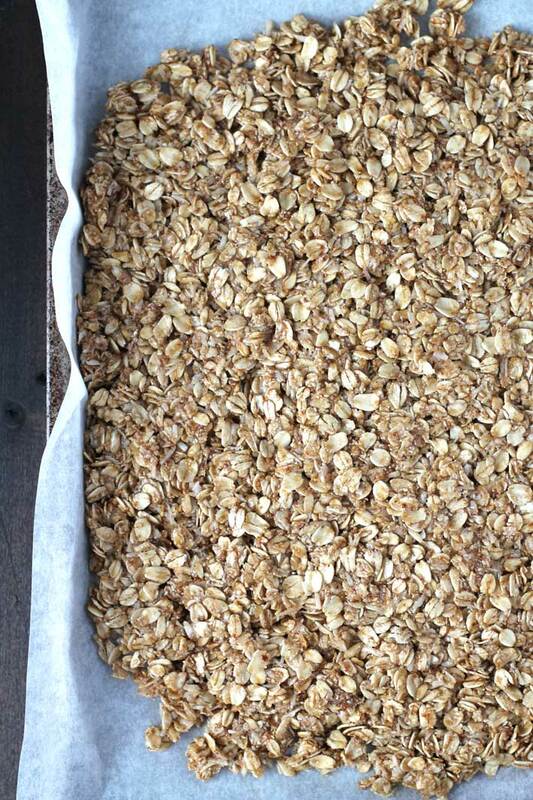 When pressing down, the mixture may not fill out your cookie sheet, that's OK. See image of granola in the pan above. You can save money by making your own oat flour by following the instructions in this post. Nutrition info listed below is for 1/3 cup (113 g) of granola and is only to be used as a guide. Click here to learn how nutrition info is determined on this website.